This page is for those who want the instructions to build an elegant lego pyramid. This LEGO pyramid a small size pyramid that you can make out of LEGO Model 6119-1: Roof Tiles. There will be two animated instructions for the same model. one is from the top camera angle and another for the perspective angle. Just start with the top-view instruction first and if you find something unclear, then go over with the perspective-view instruction. If you are ready now, let's have a fun learning to build an elegant lego pyramid. Get four of 2x4 bricks. 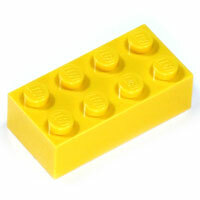 Here I am using yellow 2x4 bricks (#300124) but any color of four 2x4 bricks will be o.k. Prepare to drop one of 2x4 bricks. 1. Prepare to drop the 2nd 2x4 brick. 3. Prepare to drop the last one. 4. Get four of Roof Tile 2x4/45° (part #303721) and prepare to drop one of them. 5. Prepare to drop the 2nd Roof Tile 2x4/45°. 6. Prepare to drop the 3rd Roof Tile 2x4/45°. 7. Prepare to drop the last Roof Tile 2x4/45°. 8. Get four of Roof Tile 2x2/45° (part #303921) and prepare to drop one of them. 9. Prepare to drop the 2nd Roof Tile 2x2/45°. 10. Prepare to drop the 3rd Roof Tile 2x2/45°. 11. Prepare to drop the last Roof Tile 2x2/45°. 12. Get four of Corner Brick 2X2/45° Outside (part #4163087) and prepare to drop one of them. 13. Prepare to drop the 2nd Corner Brick 2X2/45° Outside. 14. Prepare to drop the 3rd Corner Brick 2X2/45° Outside. 15. Prepare to drop the last Corner Brick 2X2/45° Outside. 16. Get four of Roof Tile 2x4/45° (part #303721) and prepare to drop one of them. 17. Prepare to drop the 2nd Roof Tile 2x4/45°. 18. Prepare to drop the 3rd Roof Tile 2x4/45°. 19. Prepare to drop the last Roof Tile 2x4/45°. 20. Get four of Corner Brick 2X2/45° Outside (part #4163087) and prepare to drop one of them. 21. Prepare to drop the 2nd Corner Brick 2X2/45° Outside. 22. Prepare to drop the 3rd Corner Brick 2X2/45° Outside. 23. Prepare to drop the last Corner Brick 2X2/45° Outside. 24. Get two of 2x4 bricks (part #300124) and prepare to drop one of them. 25. Prepare to drop the 2nd 2x4 bricks. 26. 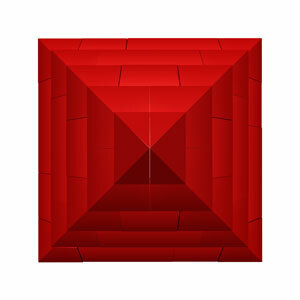 Get a 2x2 brick with any color and prepare to drop on to the center of the pyramid model. 27. 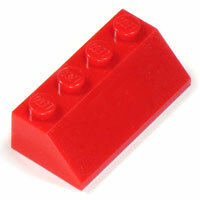 Get four of Roof Tile 2x2/45° (part #303921) and prepare to drop one of them. 28. Prepare to drop the 2nd Roof Tile 2x2/45°. 29. Prepare to drop the 3rd Roof Tile 2x2/45°. 30. Prepare to drop the last Roof Tile 2x2/45°. 31. Get four of Corner Brick 2X2/45° Outside (part #4163087) and prepare to drop one of them. 32. Prepare to drop the 2nd Corner Brick 2X2/45° Outside. 33. Prepare to drop the 3rd Corner Brick 2X2/45° Outside. 34. Prepare to drop the last Corner Brick 2X2/45° Outside. 35. 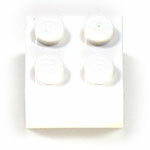 Get four more of Corner Brick 2X2/45° Outside (part #4163087) and prepare to drop one of them. 36. Prepare to drop the 2nd Corner Brick 2X2/45° Outside. 37. Prepare to drop the 3rd Corner Brick 2X2/45° Outside. 38. Prepare to drop the last Corner Brick 2X2/45° Outside. 39. Get two of End Ridged Tile 1X2/45° (part #6075074) and prepare to drop one of them. 40. Prepare to drop the 2nd End Ridged Tile 1X2/45°. 41. Congratulation! You have completed making an elegant lego pyramid. 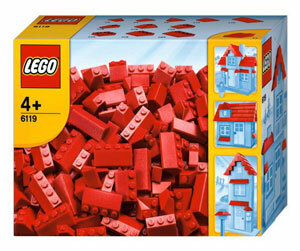 You will need LEGO Model 6119-1: Roof Tiles to make a lego pyramid. We will need six of 2x4 bricks (part #300124). The color does not matter here. Any kind 2x4 brick will do fine here. We will need eight of Roof Tile 2x4/45° (part #303721). You will find them from 6119-1: Roof Tiles. We will need eight of Roof Tile 2x2/45° (part #303921). You will find them from 6119-1: Roof Tiles. We will need sixteen of Corner Brick 2X2/45° Outside (part #4163087). You will find them from 6119-1: Roof Tiles. We will need one 2X2 regular brick with any color. We will need two of End Ridged Tile 1X2/45° (part #6075074). You will find them from 6119-1: Roof Tiles.